The Tullaghoge fort complex seen from above. A memorial stone and plaque were unveiled to mark the 400th anniversary of the death of Hugh O’Neill. The re-opening of Tullaghoge Fort last June has brought one of Ireland’s most notable landmarks back into the public domain. Also known as Tulach Óg, meaning “Hill of the Youth,” it is located in the townland of Ballymully Glebe on the main Stewartstown to Cookstown road in the east of County Tyrone. This magnificent rounded hilltop enclosure is a site of huge historical and cultural significance, and has a highly prominent place in the story of the O’Neill clan in County Tyrone and further afield. The site itself is at an altitude of three hundred feet, and consists of two circular banks, both now covered with trees. It commands wide views and is visible from many miles around; indeed many 16th and 17th century English maps of Ulster mark the area: on Bartlett’s map, circa 1600, two thatched buildings are shown within the enclosure. In historic terms, the fort has played an important role in the history not just of County Tyrone, but also of Ulster and Ireland. Originally Tullaghoge was a minor kingdom called Telach Óc, occupied in St Patrick’s time by the Uí Thuírtrí, who later moved to the eastern side of the River Bann. The Kings of Airgialla were once inaugurated here, but between 900 and 1000 the Cenél nEógain (“descendants of Eoghan” – son of Niall of the Nine Hostages) branch of the dynasty of Aileach spread south and east from Inishowen, County Donegal, through the present counties of Derry, Tyrone, Armagh, and Fermanagh and established Tullaghoge as the centre of their power. Leac na Rí, the king’s flagstone. A replica of the inauguration chair used for the O’Neill dynasty. Indeed, by the 11th century, Tullaghoge was a dynastic center and inaugural place for Cenél nEógain; and from then, Tyrone became the traditional stronghold of the various O’Neill clans and families. There are many other families who can claim descent from the Cenél nEógain, such as Devlin, Donnelly, and Hamill. 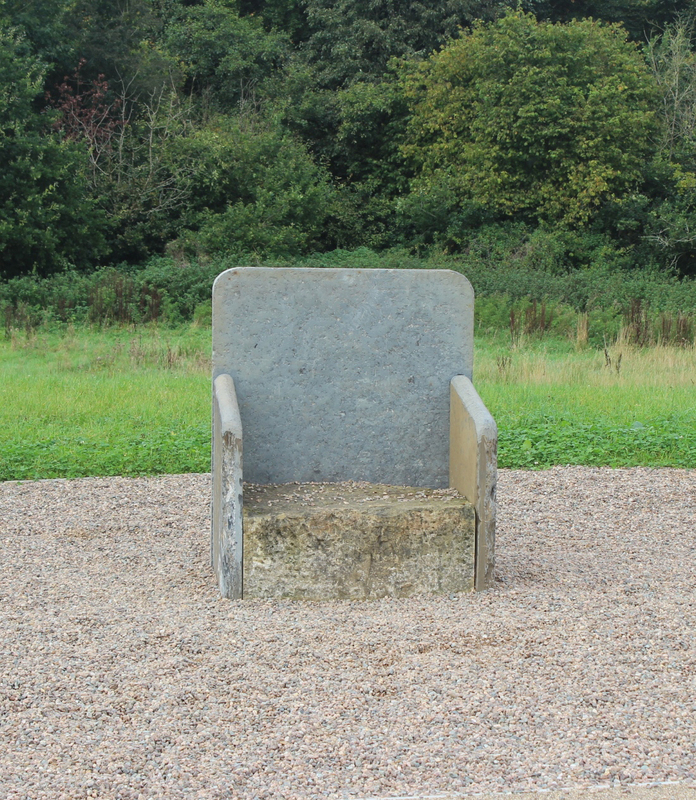 Up until the time of Brian Boru, the O’Neills were, almost without interruption, the High Kings of Ireland, and Tullaghoge continued as the ceremonial seat of the kings of Tyrone even after the O’Neills transferred their court to Dungannon (10 miles away) at the end of the 13th century. The O’Hagan clan were also prominent at Tullaghoge; they were custodians of the fort and chief justices in the O’Neill political system. Their burial place is at Donaghrisk, the circular walled graveyard at the foot of the hill. The historical inauguration ceremony at the fort was conducted by the chief of the O’Hagans, who would place new shoes on the feet of the new O’Neill chief, followed by the throwing of a shoe over his head to indicate that he would follow in the footsteps of his distinguished ancestors who had borne the title of the “O’Neill.” He swore oaths to rule by Brehon Law (the ancient laws of Ireland) and to give up the throne if he became too old to rule. The ceremony took place on a large boulder known as the Leac na Rí, which means “the flagstone of the kings” – and legend suggests it was blessed by St. Patrick. By the 16th century, it had become incorporated into a ceremonial stone chair where three large slabs had been placed around it. It is believed that at the nearby Desertcreat Church of Ireland, another part of the stone is incorporated into the porch of the Church. Unfortunately, the Leac na Rí was destroyed in 1602 during the “Nine Year’s War” by Charles Blount, later known as Lord Mountjoy, in accordance with the Elizabethan policy of destroying all Irish symbols of clan allegiance. This marked the end of the O’Neills’ reign, with Hugh “the Great” O’Neill’s inauguration in 1595 being the last to take place at Tullaghoge. He fled with members of the O’Donnell clan from Donegal to Rome (and died there in 1616) during the “Flight of the Earls” episode, which was considered a major watershed in Irish history. The European dimension of the O’Neill clan that emerged from this episode has ensured that there is a large network of O’Neills based on the continent, particularly in countries such as Spain, France, and Portugal. 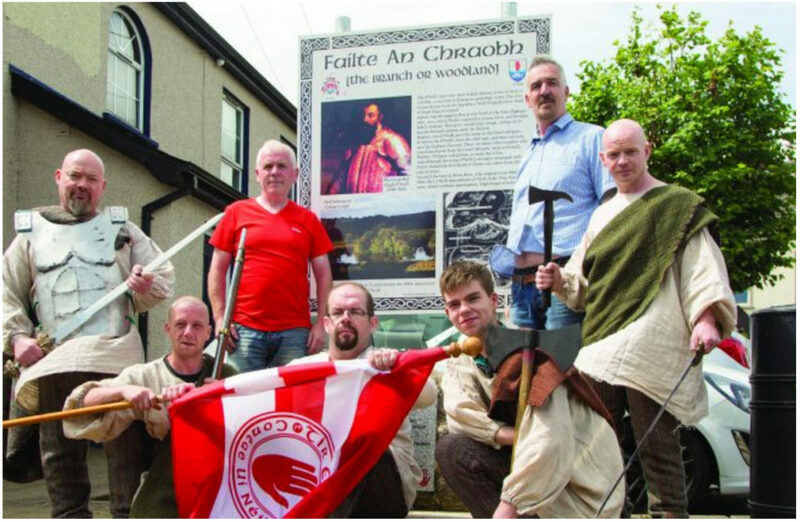 Members of the local historical reenactment group with Dan O’Neill, chief guardian of the Ancient Clan of O’Neill in Ulster, and the chairman of Stewartstown Community Group Johnny Rushe, who unveiled a memorial stone and plaque for the 400th anniversary of the death of Hugh O’Neill in The Square, Stewartstown. The extended O’Neill diaspora is considerable. Indeed, if one considers the United States alone, examples include America’s only Nobel Prize-winning playwright, Eugene O’Neill; and former speaker of the U.S. House of Representatives, Thomas “Tip” O’Neill. 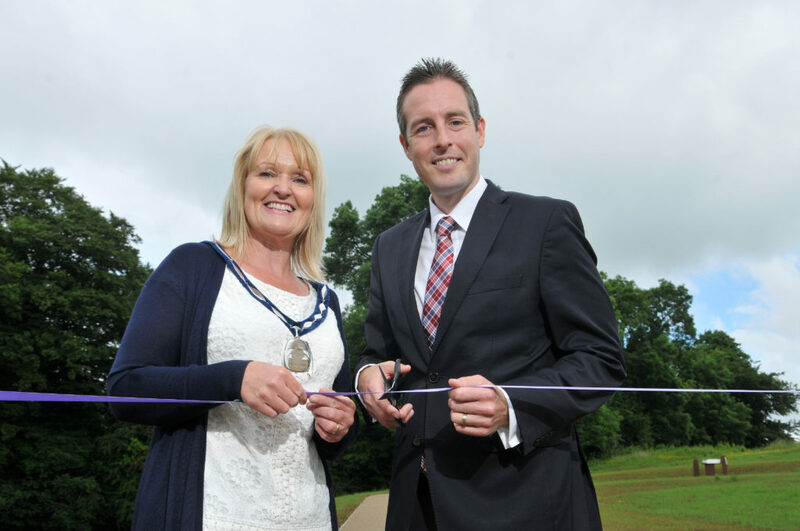 And on Wednesday June 15, 2016, another famous chapter emerged for this famous Irish historical landmark when the Minister for Communities at Stormont, Paul Givan, re-opened Tullaghoge Fort following the completion of a £500,000 investment (about $645,000). The official opening of these new facilities ensures another milestone in the history of this ancient site has been recorded. The site was closed for almost a year while development works were carried out to deliver a new car parking area, interpretation center, and a new path to the landmark. In the course of those development works, new and exciting archaeological discoveries were made, including artifacts dating back more than 7,000 years and the foundations of a medieval settlement at the bottom of the hill on which Tullaghoge Fort stands. Archaeologists working on the site revealed that flint tool fragments were found dating back before 5000 B.C. to the Mesolithic period, when hunter-gatherer settlers inhabited Ireland. Archaeologists had previously found evidence of prehistoric burial tombs at the nearby Mid-Ulster Sports Arena, less than a mile from the fort. This investment at Tullaghoge will help to preserve and protect a valuable heritage asset for future generations; and a few weeks after the official re-opening, the Mid-Ulster Council launched “The Gathering of the Clans” festival to commemorate the life of Hugh O’Neill. This popular cross-community event encompassed a week of talks, walks, tours, drama and music to celebrate the ancient site. Further details on the Ancient Clan O’Neill group are available at ancientclanoneill.com. Cathal Coyle is the author of The Little Book of Irish Landmarks (The History Press, September 2017) and chairperson of The Ancient Clan O’Neill, a group that seeks to promote the history and cultural legacy of Tyrone and the O’Neill dynasty. My great grandmother was named Mary O’Neill and my great grandfather was Michael Hagan. Both families were from Co. Tyrone. Since I have both families that are most associated with Tullaghoge in my family tree, I have always been interested in the history of Tullaghoge Fort and I have been to visit it twice. Since I live in New Jersey it’s not that easy for me to get there but I knew that I had to visit it some time in my life. I was last there several years ago, before the recent improvements, and I guess I will have to try to visit again sometime soon. I would especially like to visit some time in August when they have the inauguration ceremony there. It seems that there should be at least one Hagan there for that occasion. Thanks to those who are responsible for the recent improvements.